1. Last night before going to sleep, I was listening to my old song collection in my Laptop. I found my collection of System of A Down from their demo until their last Hypnotize album. 2. I start listening to System Of A Down when i was in form 4. They are like an underground band that would never be appear superficially in mainstream music because their music was so different. If you listen to their music for 1 seconds, then you know, this is System of A down's Song. 3. 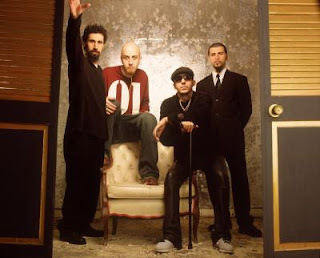 Even some of those people out there classified SOAD song as 'System' in genre. It's kind of funny, but yet it is true. They are like the pioneer of that kind of music. The founder of System genre. And until now, there is no other band that can do the same sound like them. 1. It has been a long week for me. The pediatrics exam was so up class and making me head turn around and i almost' crash' yesterday. 2. My MCQ question was quite 'normal'. MEQ is a little tough. I don't know whether i can use the word tough or not? I hate that question. I almost 100% guarantee that the answer supposed to be Acute Glomerulonephritis but then it turn out to be SIADH. What is SIADH? i know it but it is not fair to ask that in a condition where i never saw one patient with that diagnosis in the ward. 3. As i told before, what we learn in medicine, is to learn the common thing because that is what we are facing in the future. Maybe i did not study so much. Don't give reason they say. But still, i thought that the diagnosis was AGN. 4. Essay questions are quite easy. Only pulmonary tuberculosis and Hemophilia. No big deal. I end up just thinking in the end. i end up sleeping at night very well. Answering directly for the topic. It is so inhuman to do stuff like this. This is not a war but rather and extermination. War is when one side is fighting at the same level with the other but in this war, only one side got the impact. And i was really strange when people labeling palestinian terrorist is a terrorist. It is so clear for blind people to see that the terrorist is actually the israelian and if you don't called them terrorist, then no one can be called terrorist. I think, world is to blind to see. I don't care about the war, do whatever you want, but stopping the supply for food and medical supply? Please, there is thousand innoncent people inside palestine who doesn't know anything about any bombing or whatever hammas do, so killed what you want to killed but please reserved those innoncent people.